Looking to drop off papers to be shredded? ​ 419-706-4945 to schedule an appointment. Please download our pricing information. Request a shredding quote or proposal. Barnes Wendling has been using CLI for our shredding for the last 5 years. With the nature of our business, data security is of utmost importance. With CLI, we always feel our shredding is secure and their staff is courteous and professional. In spring of 2003 CLI launched CLI Document Destruction, offering certified secure document destruction to local businesses. Since then, CLI Document Destruction has grown to destroy approximately 1 million pounds of records, serving more than 800 customers each year, including banks, hospitals, and other professional offices. Our Shred Team collected a total of 9,671 lbs of material from 69 cars! Not only will that help with security season, but it will help save the planet! According to the Environmental Protection Agency, recycling one ton of paper saves 17 trees and more than 3.3 cubic yards of landfill space. That means a total of 82 trees were (hopefully) saved! And since paper can be recycled up to 7 times, there can be less tree cutting! Our primary document processing equipment is an Allegheny Shredder ¼” strip shred unit that feeds into an open-ended horizontal baler. 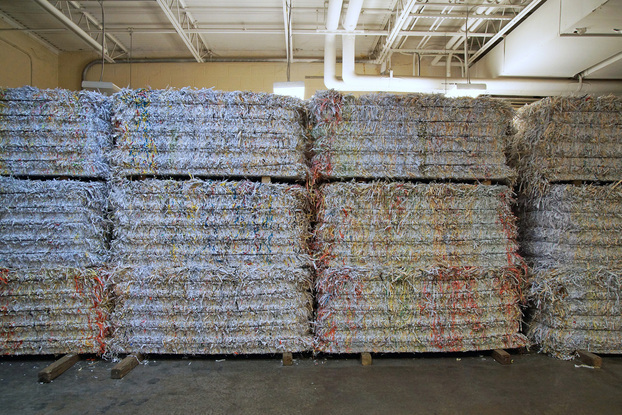 Shredded material is immediately compressed into 1,000 pound bales that are stored in our secure shred room until being delivered to paper mills to be pulped and recycled into new products. We strictly adhere to all NAID protocols, including 90+ days of archived video, background checks on all employees and careful chain of custody practices. CLI Document Destruction is a member of the National Association for Information Destruction and holds NAID’s highest AAA Certification for paper record, and micromedia destruction. We take pride in the integrity and value of our services, with security that meets or exceeds industry standards. For more information visit the NAID website. American Excelsior has thrived as a leader in the flexible foam, erosion control, and excelsior wood fiber industries. Learn more here. The Ohio Veterans Homes are a State of Ohio establishment comprised of three facilities – a nursing home located in Georgetown, and a nursing home and a domiciliary located in Sandusky. Each one offers a quality of life which emphasizes privacy, encourages independence, provides comfort and security, and meets social needs. Learn more here. Norwalk Wastewater Equipment Company (Norweco) is a manufacturer of water and wastewater treatment products, systems and chemicals. Learn more here. Barnes Wendling CPAs has been serving closely held businesses and not-for-profit organizations since 1946. Barnes Wendling CPAs remains independent and free of outside interests, enabling us to offer advice and solutions that truly are in the best interest of our clients. Learn more here. The Chef's Garden provides customers with safe food, direct from the farm that they can be confident to serve their guests. Learn more here.